There’s myriad information out there that we, as brewers, tend to take as fact simply because it has always been fact. Things like “hot-side aeration is bad” and “pitching at a slightly lower temp produces a better beer”. I’ll be the first to admit that I’ve considered both of these things as hard fact, without really looking into them. Why wouldn’t I believe the masters? Those who have come before me and have already been perfecting this art? Circumstances change, processes change, and I’ve come to believe that testing these “facts” is important. Enter Brülosophy (the two dots above the u are called an umlaut, they denote a front-rounded vowel. So think “brewlosophy”. Linguistics. They also happen to make a smiley-face. And they’re totally metal). This blog is run by Marshall, aka Brülosopher , and in addition to being an awesome guy he has been doing some fantastic work in testing the long-held beliefs of the brewing world. One of his exBEERiments that I found particularly interesting was “The Great Trub ExBEERiment“, in which Marshall tested how trub (hop matter, hot-break, the junk you leave in the kettle after the boil) affects the final taste of beer. Before reading any more of this article, I recommend you read Marshall’s article. Marshall concluded that the beer fermented with trub was brighter, clearer, had more hop aroma, and had a sharper and crisper flavor. Non-trub was smoother, and participants were pretty split on which beer they preferred. He recently repeated this exBEERiment with a Vienna Lager, and found that there was no statistical difference between a no-trub and trub batch, though were certainly differences in the fermentation. This is really interesting data, and if nothing else it suggests that maybe it won’t ruin your beer if you happen to get some trub in the fermenter, but it could certainly change the perceptions of it. While his results may be accurate for a cream ale or Vienna Lager, fermented at those temperatures, for those particular yeasts, etc., it doesn’t say much about beer in general. At least, not yet. It’s no secret that Marshall loves lagers, and for this exbeeriment he originally used a cream ale, and the second time around used a Vienna Lager. Me? Give me something dark, roasty, and 8% alcohol. Like this Old Ale. I don’t have too many pictures of this part of the process, but everything was incredibly standard. I mashed in at 152°F and thank God for giant whisks! This thing was nothing but dough-balls and was almost too much for my mash tun, it was quite the bill. Amazingly, I only last one degree over the 60 minute mash. I did my 60-minute boil, nailed my volumes, and hit my intended OG of 1.090. In the first fermenter went 3-gallons of crystal clear wort, and into the second I, quite literally, dumped liquid and trub, leaving a bit of liquid behind in the kettle to make up for the space the trub took up. I oxygenated, pitched, and oxygenated again after 12 hours. Surprisingly, there was a huge difference in fermentation. I’m fairly positive (as positive as one can be in this situation) that I pitched the same amount of cells into each fermenter. No-trub had the first visible signs of fermentation, but trub had a more vigorous fermentation throughout. This was my first time using 1968 London ESB, so I didn’t have experience to compare this with, but it seemed like both batches had a good fermentation overall. Want to guess which one is No-trub? While both have residue on the fermenter, Trub clearly tried to spit all of the trub back out of the airlock (this is how Ray Found phrased WLP007 to me, I thought it was appropriate). For those still unclear, No-trub is on the left, and Trub is on the right. This is a better shot of what has settled, and you’ll see that Trub has significantly more matter at the bottom compared to No-trub. Both of them hit 1.025, a bit lower than predicted which is just fine with me, I was a little worried about this being too sweet anyways. Trub and Non-Trub were, of course, primed separately to 2.2 volumes of Co2 using table sugar dissolved in one cup of water. They were kept in a dark cabinet, together, which typically sits around 68F, and were given three weeks to condition. It was pointed out to me by /u/Rayfound that, because I bottle condition, that it could be challenging to eliminate the variable of pouring. How it is poured, into what sort of glass, how much sediment is in the beer, all of these things could influence how the final beer is perceived. I’m a bit on the fence here, I’ll be honest. On one hand, I want to ensure the only variable is the Trub, since that is what is being tested here. From a scientific (if you can call this science) standpoint, it would make sense to eliminate as much as possible. That said, I’m more interested in general practice than anything else. In practice, I wouldn’t try to control the pouring variables. I’d leave sediment behind, sure, but I wouldn’t be meticulously detailed to ensure every taster had the same pour. If I control the pour, and trub makes a difference, great. But if I don’t control the pour and trub doesn’t make a difference, then I would call the results negative, because I don’t, in practice, control the pour. I split this batch with wood, and so I have 8 “controls” of trub, and 8 of no trub, control meaning batches that were not racked onto wood or blended. Two of these belong to a competition, and two of them are going to be kept to test them against the various kinds of wood I used. So that leaves 6 of each. I was fortunate enough to have six people volunteer to do the tasting, and for this test I decided to control the pour as best I can. Since I didn’t pour each person a full glass, I had some left over and two more people volunteered. For these two people, I didn’t control the pouring at all. Not enough people to make a definitive claim, but could absolutely hint at something. And, of course, in true Brulosophy fashion, I did a triangle test. Each person was presented with two examples of Trub and one example of Non-Trub. They were asked to describe the appearance, aroma, and flavor of the beers, and the differences (if any) between them. After that, they were asked to pick the odd-one-out. Out of the original six tasters, four of them accurately picked out the odd beer, Non-Trub, and two concluded it was the same beer in all three glasses. It was a fairly divided spread, which I found surprising, and it was a statistical difference, which isn’t something that we have seen in Marshall’s tests Marhsall pointed out to me that to be a statistical difference, five tasters would have needed to identify the incorrect beer, so we are actually consistent with Marshall’s findings! No one thought that Trub and Non-Trub appeared to be any different. No one thought that Trub and Non-Trub smelled any different. Three of the testers thought that mouthfeel was exactly the same, and one thought they were very similar. Three of four tasters noted that Trub had a lingering flavor quality, despite being cleaner in the middle of the sip. Three people said this. I find that pretty interesting, because the “clean” quality is consistent with Marshall’s findings, while the lingering quality is not at all. One of them accurately picked Non-Trub as the outlier. Both said the beers were incredibly similar in taste, appearance, mouthfeel, and smell. The one who picked Non-Trub as different said that to him the glass appeared to carbonate differently and that there seemed to be a bit more of an astringent character in the Non-Trub beer. Of the five total individuals who picked No-Trub, four preferred No-Trub and one preferred Trub. My Impressions: I had a friend serve me these beers side by side, and I honestly wanted there to be a big difference between them. Considering the fermentation difference that I had witnessed, I was so ready for these to be different. I wasn’t served these beers before the other tasters, so I had no idea what they were talking about, but I can see it. They are so similar, it’s astounding. Non-Trub is different, but when I was doing my own tasting, I didn’t guess correctly, even knowing Marshall’s results. Once I read the results from other tasters and learned which was which, I could taste the difference, but I chalk this up entirely to confirmation bias. I can’t even say which one I like better, because I originally perceived them as so similar. I’m excited to try them in a few months to see how they age, and if they age separately. So, what does this mean? Beyond “having trub in the fermenter won’t ruin your beer”, not much. My results were fairly consistent with Marshall’s, but not dead on. 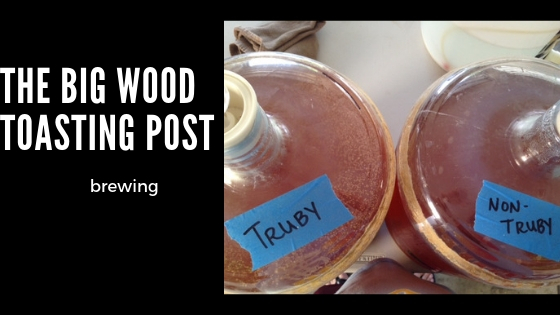 The Trub beer had a linger flavor quality, no statistical difference, and more people preferring Non-Trub to Trub. Either way, I found these results really interesting and hope to use it as another data point to be used in this discussion! Special thanks to Marshall for initially doing this exBEERiment (and let’s be honest, all the work he does to deliver these things) and the tasters who took part in this test!